“… Alma took Helam, he being one of the first, and went and stood forth in the water, and cried, saying: O Lord, pour out thy Spirit upon thy servant, that he may do this work with holiness of heart.” (Mosiah 18:12) I wondered about these words. Even at seven years old, they impressed me. A man desired to do the work of the Lord. He asked the Lord for power to do that work. I can’t tell you all the reasons why the wording is different or important but I can tell you this: I know the Lord was pleased I chose to be baptized again by someone using these words. I hope you can see it in my face in the photo I have included in this post. I knew I had completed what the Lord had asked of me twelve days earlier in Mesa, Arizona on the 9th of September, 2014. I knew I needed to be baptized in this manner and I was not going to argue with anyone about it. Because the LDS Church considers it an act of apostasy to be baptized again, and I had no desire to argue about it, I resigned my membership. I was then free to follow the commandment of the Lord to be baptized in the correct manner, using the correct words. It was a wonderful feeling. I appreciated being joined by others who were baptized with me today. I will be forever grateful to the man who traveled from his community in Utah to baptize us. There were eight of us who met to discuss the gospel and partake of the sacrament in my home. We used wine – not water – as the Lord directed in the scriptures, grape juice for those who didn’t want to drink alcohol. It will be awhile before I am able to join with a community who believes as I do. There are not enough in my area here in California. Having received the priesthood from my father, I can bless and partake of the sacrament in my home. That authority is not controlled by the LDS Church, just as the spirit of the Holy Ghost is not controlled by the Church. I felt the Lord’s spirit today. I will be content with the community I feel with so many of you who read my blog. I know there are many who disagree with what I have done. I understand. Carol and I had a visit with a friend from Colorado after the baptism today. He is a family counselor. We discussed the importance of following the promptings of the Spirit, who leads us to Christ back to the presence of the Father. Even though I try, I don’t think I will ever understand how deeply this has affected Carol. She was not happy with my decision. Five or six generations of Mormonism have ingrained within her traditions that are not part of my heritage. To me, it was a simple logical decision. I studied the writings of a man who claimed to have seen the Savior. I confirmed his claim in solemn prayer. This man claimed to have been given a message from the Lord to be delivered in a series of ten lectures. I read, listened to, attended some and studied all of the lectures. I was and am convinced the message he delivered is authorized of the Lord. I confirmed this using the principles I learned growing up in Primary, Sunday school and seminary – I studied them out, then asked the Lord. I have been told by some, including Carol, that the message of this man is offensive. I did not find it so. It felt right as I studied it. It felt good. I guess you can say it “tasted” good. It fed my soul. The message led me to the scriptures. It caused me to ponder them again and again. I acted upon the message. I exercised faith in prayer culminating in the action I have taken this day. My friend from Colorado delivered a book to me at the Mesa Lecture. It took him years to write. From what little I have reviewed of the book, it is filled with truth – 77 Truths to be exact, which is the name of the book and the website. I have perused it and intend to review it in a future post. It has nearly a thousand quotes and probably an equal number of scriptures. It will take time. Bret, the author, asked that new readers commit to reading at least the first three chapters, and then, if the spirit prompts, up through chapter twenty-one. That’s only 107 pages. I can do that. I plan to read those first 107 pages before the end of the week. I hope some of you will take a look at Bret’s book with me. He worked closely with the Lord to bring it forth. Truth brings us light. When I asked the Lord about being baptized, I received from Him a promise. I asked if I could share it. He agreed. His promise to me is that by being baptized, I have demonstrated acceptance of the messenger He sent, and therefore, over time, and through effort, can receive the same kind of knowledge this messenger has received – a knowledge of what the Lord will soon accomplish. A man is saved no faster than he gains knowledge, for if he does not get knowledge, he will be brought into captivity by some evil power in the other world (TPJS 217). The message delivered by the servant should be carefully studied. I have put dozens of hours into it already. That is not enough. Each portion of the lecture deserves, indeed requires, dozens of hours to comprehend. The Lord commands us to seek learning, even by study and by faith (D&C 88:118). It is one thing to be able to quote scripture, recite passages from writings or lectures of inspired men. It is quite another to obtain knowledge from heaven and from heavenly beings. That is the promise of the Lord I have received – that eventually, I will be taught by heavenly beings. It is made sure. Wow! My heart is full reading this, and yes! I can see the joy in all your faces in this last picture! I wish I could have been there! I wish I could sit down with you and talk, face to face. Maybe one day. You are an inspiration. Tim, I’m so happy for you. What a great day. I pray for you and your family, and I’m glad I had the chance to meet you in Mesa. I’m looking forward to my own baptism soon. God bless you! ♡♡♡ You radiate much light. I feel the rejoicing. May Father and His Christ continue to watch over you and keep you. Wow, wow, wow. GOD is Good. Love you Tim. Tim… words cannot describe the joy in my soul as I read this post and more importantly looked upon your countenance in the pictures. I shouted HALLELUJAH! Your faith is epic…..
Tim, the photos really do show your joy. I am happy for you. How did Carol feel as she attended and witnessed? Does she view you as lost, covenants broken, bereft of the Spirit, etc.? Were there any gifts of the Spirit manifested such as being rebaptized by fire and the Holy Ghost, prophecy, visions, etc.? Carol took the photos. I think the best word to explain Carol’s feelings, one she used today as we were discussing the day’s activities with Bret, is betrayed or possibly cheated. That’s really not fair of me to say how she felt because I can’t possibly know other than what she said. I won’t share what Mike wrote in a private email. It was sacred. If he wants to share it, he can add it. I will say I felt light and joy at the time. Now that I have done what I felt the Lord asked of me, I feel more confident in going before the Father to ask for greater knowledge. I would like to go ahead and share my thoughts and experience from Sunday, having had a couple days to process, and having been rather busy from that time until now. I met with a small group Sunday with Tim, and we spent time getting to know one another and partook of the sacrament, after which we went to the Pacific Ocean and some of us were baptized. When we had the sacrament and Tim began blessing it, as we knelt I felt as though my head was opened up and a strange warmth flowed in, down through my head and shoulders. It was similar to the warmth of the sun, but as I wrote in my journal, it was different. There was a sense of actual light and warmth but also a tingling, as well as a weight like 1000 eyes watching me, which was interesting. I sensed that it poured from an opening in the heavens, that I was feeling heaven open and acknowledge my participation in the ordinance. My heart burned and radiated through me. This was quite the sacrament to partake of, kneeling together and sharing bread and wine. When we went to the beach and performed the baptisms, I experienced a similar thing as soon as Jim pronounced my name and proceeded with the ordinance. The sun was out, but the warmth that came down was from a different direction than the sun, and I felt again the eyes of heaven watching. I knew they acknowledged what I was doing, and that it was good. Some may naysay this, or seek to find a means to rationalize it away, being unwilling to accept that the Lord would endorse such a performance outside the bounds of the LDS church. It doesn’t matter. God saw it and acknowledged it, and all the complaints and denials in the world cannot change it. They can only serve to hedge up the way of those denying it. It is true, it was real, and no power on earth or in hell can ever change it. Fantastic!! So happy for your decision. I too, will do the same this coming weekend, hopefully. Great to have met you and your wife at Sunstone. Tears of joy for you and your renewed covenant. The Spirit tells me that what you have shared is Truth. Thank you for your counsel to love my wife without reservation in spite of our different opinions. Tim, I just have to add my congratulations. Sometimes it hurts (those we love) to do what the Lord asks, yet He will recompense. I pray for you and Carol. God bless the both of you. I know for myself those kind of differences are ‘challenging’ to say the least. It is a delight to see the joy on your face in those pictures. I can’t wait until I can do the same! I don’t see a reason to believe that the LDS church does not continue to hold and exercise the keys of the priesthood of God. Be careful my friend. I stand with Richard Alger. Be careful friend. Should your new found faith include practicing polygamy I hope you will run the other way. Jared: Agreed. Plural marriage is not for me. For Greg (Stockoneder): I read your post. I differ on your statement that God is not married. Are you saying there is no Mother in Heaven? [Lec 5:2b] whether in heaven, on earth, or in the earth, under the earth, or throughout the immensity of space. [Lec 5:2c] They are the Father and the Son: The Father being a personage of spirit, glory, and power, possessing all perfection and fullness. [Lec 5:2d] The Son, who was in the bosom of the Father, a personage of tabernacle, made or fashioned like unto man, or being in the form and likeness of man – or rather, man was formed after his likeness and in his image. This teaches God and Jesus were the sole creators of everything that was created. Additionally, if God needed a female God to create us then He couldn’t make the claim to be all powerful. He would then be dependent on a woman God to let Him enact His plan. God can control and influence all element to do his will and to become almost anything as a result so why would He have to be dependent on the womb of a goddess to birth His creations? The belief in a Heavenly Mother is derived from the abominable belief in polygamy/plural marriage and that eternal procreation is going to be part of the next life, which is false doctrine. It is a result of men falsely anthropomorphizing God and trying to use that to justify their sin. When we are resurrected our eternal spirits will become INSEPARABLY connected with eternal elements. Inseparably connected to me means we wouldn’t be engaging in sexual relations because that would negate the statement made above. We will be very different beings than we are now. In order to become immortal a huge physical change will take place. Our immortal bodies will be vastly different internally and we wouldn’t need to breathe, eat or have any eliminations of any kind, as that would mean we wouldn’t be inseparably connected with the eternal elements we would be constituted of. This would also preclude giving birth, obviously. So, no I don’t believe we have a heavenly mother or that one was required at all. Thanks Richard. I agree. Care is needed, as is feeding of the spirit – through study and prayer. That’s why I’m embarking on a reading program of Bret’s book to supplement my regular gospel study. Do you believe in the forbidding of others in taking of the sacrament? I thought I had read that somewhere in Denver Snuffers teachings. It certainly teaches this principle in the Book of Mormon. Do you believe that the keys of the priesthood rest solely in the LDS church? If you do you would not have resigned your membership. I have not read the whole comment thread, or every one of your other posts so please pardon me if you have addressed this earlier. Bret is a friend from Colorado. I met him the night before the Las Vegas lecture as I partook of the Sacrament with friends. You read Denver’s words below and tell me if you think he forbids partaking of the sacrament. I do NOT believe the keys of the priesthood rest solely with the LDS Church. I am not sure keys refer to authority. I am more convinced keys refer to knowledge received from the Lord. “As to the Sacrament, only an antichrist would forbid you from partaking of the Sacrament in the way commanded by your Lord. That is an abomination. If you get together, even if it is only in your own family, partake of the Sacrament together. Let no one forbid you from partaking in remembrance of Christ. He commanded that you do it. Follow the pattern that is given to us. In Doctrine and Covenants section 20, verse 76, one of the things that used to be practiced, and has been abandoned, but should now be renewed among you, is that when the Sacrament is blessed, kneel. “Kneel with the church” is how the verse explains it. It is in the scriptures before you. Follow them. Every time you partake of the Sacrament it is a reminder of the promise there will at last be some great wedding feast. It is not just in remembrance of the blood and of the body, but it is also a preliminary to the final feast the Lord intends to offer in which His blood and His body achieve success in redeeming some few! His atonement was to redeem. The wedding feast is a celebration of the Lord’s triumph. But His triumph produces saved souls. The redeemed are His great trophy! That seems pretty clear to me. Jesus said we should not knowlingly let anyone to partake of the sacrament unworthily. To me that means the judge in Israel, the bishop is the one to decide if someone is worthy or not to partake. Richard: Love that scripture. Thanks for adding it to the dialog. We, those who have left the church, need to heed that scripture. In my case, since I am not part of a community yet, when I administer the sacrament, it is for my own worship in remembering the Lord. For those who have been sustained to administer in a community, they need to carefully consider the words of the Lord. To do so, we must define what it means to be worthy or unworthy of partaking of the sacrament. That understanding is a big part of why I left the church. I’m grateful to know the priesthood is not controlled by the church. The church depends on the priesthood. The same is true for receiving the Holy Ghost. The LDS Church – or any church – does not and cannot control the receipt of the Holy Ghost. This is a new paradigm for most. Why do you think you have authority given to you to administer the sacrament? How did the one you baptized you obtain authority to do so? Is not the priesthood required to give someone authority to “receive the Holy Ghost”? Hi Richard. My father ordained me. Aaronic priesthood can be passed from one man to another. I asked the Lord if I had authority to administer the sacrament. He told me I could do so in my own home and family or among guests in my home. Hope these help. God bless. If Aaronic priesthood can be passed from one to another, then it can be revoked. Only those with the keys can revoke this. You have removed yourself from the body that gave you the authority. If we only need to ask God if we have authority then it is the “priesthood of all believers”. There must be order in the kingdom of God. There must be those with keys that direct this work. So that there is not confusion. Hi again Richard. It is true. I have no authority to exercise priesthood in the LDS Church. But I do have authority to exercise priesthood in my home. That is not controlled by the LDS Church. Think of the example of the Aaronic priesthood in the Old Testament. It is very enduring. It was passed down from Aaron all the way until the Lord removed it from the Jews through John the Baptist. It is clear it must be received by ordination from one who holds it. That is why I provided my priesthood line of authority. Although it states it is for the Melchizedek Priesthood, it is the same for the Aaronic. As far as the Holy Ghost, all I can tell you is I still feel both the presence of the Comforter and his influence upon my heart and mind. In fact, after my baptism, the sweetness of the Comforter is stronger. We have the example of Joseph and Oliver receiving the power of the Holy Ghost in great abundance when they baptized one another. They also ordained one another after John the Baptist gave them authority. How did the Lord remove the Aaronic priesthood through John the Baptist? I don’t understand you decisions. Time will tell what is right or wrong. It seems you have many trying to convince you of your error. I wish you well. May the Lord guide you to truth and happiness. If you will accept it, the Lord has done this again, in our day, right in front of our faces. Yet so few have seen it or care to believe it. You are correct. Time will tell. Thank you for your kind words. God bless. Why do you believe that Joseph Smith Jr had authority and Thomas S Monson does not? At what point did the authority leave? Richard, I’m going to chime in here because I feel sorry for Tim. You guys are going in circles. If you want to understand what Tim is saying about authority, you must read Denver’s last lecture. 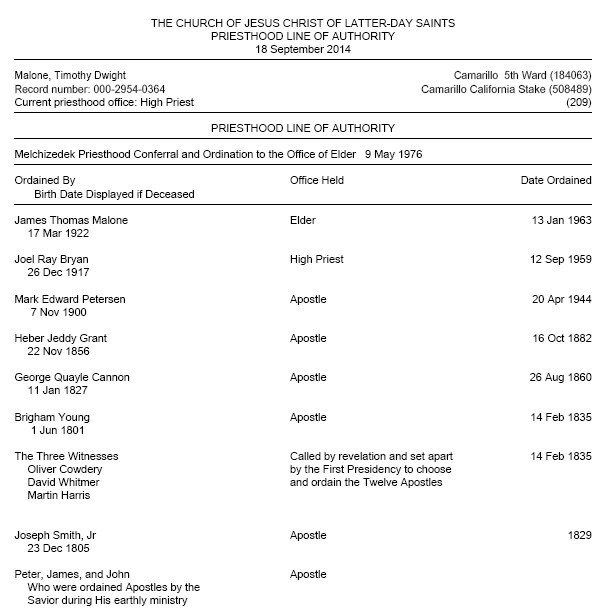 Here’s my recap of these issues: Joseph Smith had the priesthood, both Aaronic and Melchizedek. At some point, God removed Melchizedek priesthood from the Saints because of iniquity, which is why he instructed the saints to build a temple in Nauvoo where he could restore the fulness of the priesthood to them again. (Section 124, I think.) Joseph still had it himself, and individuals have always been able to access Melchizedek priesthood directly from heaven, but how many people actually fulfill the responsibilities and rights of that priesthood as described in section 84? We don’t have that priesthood as a people, clearly. And when we failed to follow the commandment to complete the temple and Joseph was taken from us, we lost the opportunity. So Melchizedek priesthood do not stock around after Joseph. Aaronic did, however, until earlier this year, according to Denver, and you must read that talk if you want to understand why. Thank your for your reply. I don’t see a reason to believe Denver Snuffer. I see the gifts of the Spirit in my life and in many others. I have a testimony that the authority of both priesthoods remain in the LDS church and are directed by those with the keys. We will probably have to leave it with what we do agree on. We will tell in time what the fruits are of those who follow Denver Snuffer or have separated from the church for other reasons. I wish you Heavenly guidance in your lives. And yes, Richard, I can appreciate what you are saying. I would do only what you feel the Lord is telling you to do, not what other men advise. Stay true to your relationship with your God and his direction. What will your next step be? My next step is to read and study Bret’s book. It’s what the Lord has confirmed in prayer for me, in addition to my regular gospel study. Congratulations, Tim, on an important day for you. Congratulations. It is odd the different perspectives on the things happening. I have felt the Spirit about rebaptisms but I have not received a confirmation for myself to be rebaptized yet. I know what is happening with Denver is planned by God but I also have not been impressed to join. So odd. I find Richard Alger’s view very strange. From an objective view what, I wonder, has Richard witnessed from the quorum of the 12 of the First presidency that would lead him to believe they have any keys of the priesthood at all? New revelation?…. No (unless you buy that policy changes are revelation). Miracles?…. Not that anyone has seen. Any signs promised by the Savior that would follow believers?…. Nope. But hey president monson can tell a good story and inspire millions by regurgitating Charles Dickins a couple times a year. I don’t see any reason to believe that the LDS church has any keys at all. I haven’t seen anything from Denver either but I think both camps can be preparatory. I feel the same as you, Minorityofone. I have not been impressed to be baptized myself, but I have felt the spirit powerfully when reading DS’s talks and books. I definitely feel he is a true messenger and I would definitely join a community to study and meet, but baptism has to wait. Not sure why or until when. I’ll just go with what the spirit tells me. I encourage us ALL to be cautious and united wherever possible. Don’t rush into this. Study and fellowship is good. I asked for and received a promise from the Lord if I took the step to be baptized, he would help my family deal with the difficulty he knew such a move would cause. I cannot begin to thank Bret and Samantha for answering my prayer. Their two-hour visit to my home right after the baptism allowed Carol to express her feelings with a couple who are skilled in family counseling. I was overwhelmed as I witnessed the hand of the Lord in action. That is good to know others are receiving the same things. I definitely do have a witness that The Lord is preparing many people for a great work. I know Denver is a forerunner of some sort. I am interested to see how the GAs will react (if at all) in conference. I truly believe with all of my heart that there are men like Moses on the earth being prepared and that all the kinds of miracles spoken of in the Book of Mormon and bible will be done again in our day. I want to congratulate you. I firmly believe that your leap of faith will lead to many wonderful gifts and miracles from God. Your wife, and I hope my wife, will begin to see more and more good fruits coming from the actions we are taking to exercise faith and experiment upon the word, and I think, as a result they will in time be persuaded. I have heard great things from some of the communities forming. In one instance a family was given 5k who desperately needed it. They were overcome and hearts “melted” I am told. Thanks for standing up for truth at all costs Tim. I look forward to getting to know you better in the years to come. First post on a new blog – Anonymous Bishop. Like. I just read the commentary on Heavenly Mother. Scriptural evidence? Wow read the Bible. Really study Hebrew and the translation of Holy Spirit (ruach or pneuma = female) study proverbs and what wisdom (Greek = Sophia). Why did the rod lead to the tree of life OR the fountain of living waters. Why two things that both symbolized the love of God. Many consider the word God (especially anciently) to mean the Mother and the Father. Read the teachings of St. Issa where Jesus teaches that the Mother is the Creator of the Universe! Read the Nag Hammadi or any ancient Gnostic texts. How about the fact that in the temple of Solomon a statue of Asherah was set up right next to a statue of Jehovah? Oh and please look up the word Shekinah which has been around for thousands of years and equates to the glory of The Lord filling the temple. Also the word Charity itself is always referred to in a female sense. There is so much scriptural evidence of Heavenly Mother it is ridiculous. The cloud on the mt of transfiguration was symbolic of the Shekinah. More than likely they heard Heavenly Mothers voice bearing witness of Jesus on that occasion. You can try and interpret it all differently but don’t say there is “no” scriptural evidence on the subject. None of that is evidence there is a female god whom God is married to. Mosiah 4:9 Believe in God; believe that He is, and that He created all things, both in heaven and in earth; believe that He has all wisdom, and all power, both in heaven and in earth; believe that man doth not comprehend all the things which the Lord can comprehend. 2 Nephi 2:14 And now, my sons, I speak unto you these things for your profit and learning; for there is a God, and He hath created all things, both the heavens and the earth, and all things that in them are, both things to act and things to be acted upon. 3 Nephi 9:15 Behold, I am Jesus Christ the Son of God. I created the heavens and the earth, and all things that in them are. I was with the Father from the beginning. I am in the Father, and the Father in me; and in me hath the Father glorified his name. John 1: 1 In the beginning was the Word, and the Word was with God, and the Word was God. None of these scriptures tell us there is any other God besides God the Father, and Jesus Christ. No “she” god is mentioned or even possible according to these verses, unless you think God is a liar. Add these to the passages I cited from the Lectures on Faith and it is clear there is no mysterious female god behind the scenes. God doesn’t need a female womb in order to enact His plan nor does He need a wife to make Him complete. He is God, He is perfect and He can create whatever he chooses by His power, without being dependent on a woman to allow Him to do so. Hey Tim! I just read on a blog that the church is requiring new converts to pay a tithe or tithing and attend meetings before getting baptized. Do you or anyone know when this change occured? Isn’t this a form of priestcraft? I’m pretty shocked at this so called “inspired” change. Just read the Centerville Transcript on covenants this morning. DS has been striking hints in these transcripts of his Mesa talk throughout. The Church has given us kindergarten for far too long. This is an amazing transcript. I believe there will be few who will be ready (…as in the days of Noah, wherein there were few that is eight that were saved by water…). Knowledge saves, and the land is barren of knowledge and full of darkness as spoken by Enoch. I have sent the Centerville transcript to one of my sons. I told him to read every word and tell me after prayer and pondering that there isn’t a message there. It is powerful. I know it is out of order, but I feel it was meant to spark something. We shall see. It is not the servants the Lord is admonishing, it is the branches that are to be grafted in that he is admonishing. We shall see. What’s your new religion called for the ppl that want to leave the traditional Mormons? Hyrum: How about we go with the church of Jesus Christ? Note the lower-case c in church. This is not a legal entity. It is a non-centralized, non-hierarchical community of believers, followers and disciples of Jesus Christ. Some are in small family units. Others are organized communities. We believe in working to relieve the poor among us. In other words, Zion. You want to be part of our community? We’ll be happy to teach you the gospel of Jesus Christ and baptize you according to his pattern. Then you can help us seek after the welfare of the poor. Can u guys have multiple wives? Yikes. No polygamy, and it’s not a new religion! It’s disheartening that this is what people are asking first when they hear about it. 😦 They have entirely missed the point. Since you still follow Joseph Smith Jr and the D&C,there is still a problem as you know.Good luck! The beauty of it Dave is these people are not following Joseph Smith or the Doctrine and Covenants. They are trying their best to follow the Spirit of God. If there is anything out of harmony with God in the teachings of the man Joseph Smith or the Doctrine and Covenants, for example section 132, then it will hopefully not be followed. Don’t know if God has filled you in on the secret yet but section 132 is not from Him. I like what someone else recently wrote in the comments of my Facebook group about Section 132: If you dig too deeply into section 132, you had better be prepared for what you discover. I’ve made up my mind: I will not practice plural marriage or polygamy. I don’t think it’s intended to be a part of Zion. One wife is enough for me, thank you. Denver doesn’t say 132 is not revelation. He believes it is three distinct sections, and each applies to separate situations. Reread it and notice that all the stuff about marriage and exaltation at the beginning of the section, 30 verses or so, is only about A wife. It only starts talking about wiveS later. Do a search on his blog, or listen to the mormon stories podcast to hear what he has to say. There are clearly some advantages to not having a formally organized entity, but does that also mean that all tithing donations used to help the poor will no longer be tax-exempt? I have kind of enjoyed having that tax exemption for charitable contributions. Hi Sam, that’s a great question for your tax advisor. Tithing and other charitable donations are allowed for those who itemize deductions every year in the United States and elsewhere. And surely tithing to the LDS Church is not the only allowable charitable donation. We give to the Red Cross, the Salvation Army, Goodwill, and a half dozen other charitable entities. Addendum: But I think you are correct. How does one claim a tax benefit when paying tithing to a small community? My answer is I don’t pay tithing to get a tax benefit. I pay it to be obedient. 1 Verily, verily, I say that I would that ye should do alms unto the poor; but take heed that ye do not your alms before men to be seen of them; otherwise ye have no reward of your Father who is in heaven. 2 Therefore, when ye shall do your alms do not sound a trumpet before you, as will hypocrites do in the synagogues and in the streets, that they may have glory of men. Verily I say unto you, they have their reward. 4 That thine alms may be in secret; and thy Father who seeth in secret, himself shall reward thee openly. You have betrayed your wife and your sacred covenants. I advise you to repent now before it is too late. Tell me what I need to do to repent, ling366. Tell me what I need to change. Which covenant have I betrayed? Have you listened to Elder Halstrom? “Some have come to think of activity in the Church as the ultimate goal. Therein lies a danger. It is possible to be active in the Church and less active in the gospel. Let me stress: activity in the Church is a highly desirable goal; however, it is insufficient. Activity in the Church is an outward indication of our spiritual desire. If we attend our meetings, hold and fulfill Church responsibilities, and serve others, it is publicly observed. Excellent – most excellent … Things are proceeding just as I had planned…. I didn’t know Korihor was alive and well in American Fork. I invite you to repent, Korihor, and come unto Christ. Don’t allow any man to stand between you and the Lord. Remember what happened to Korihor in the end. He denied Christ, was struck dumb, and was run over by the Zoramites. It would be better for Korihor if he had cried mightily unto the Lord until He answered. Is there a fellowship in Salt Lake City? I am interested in attending and learning more. Where can one find local Fellowship Groups, in Utah County, fredproulxjr@gmail.com 801 704 0900 thanks.